Pop music is such a vague label. In terms of mid-‘90s music history, what was popular could have been anything from harder alt-rock grunge to the most bubblegum of pop you’ve ever heard. Today’s band falls somewhere in that spectrum, maybe with a few horns mixed in for good measure. Steve Harwell was in a hip-hop group called FOS (Freedom of Speech) in the early 1990s but decided to switch it up. He was introduced to a guitarist and a bassist through his manager who knew them both from a local punk band. The manager got the three together for a dinner meeting and they instantly hit it off. They began rehearsing—converting the manager into a drummer for the time being. They decided to form a band, and being football fans, they went with the name Smashmouth, a term used for a team with an aggressive style of play. Later turned into Smash Mouth, the extra space turned into a record deal, with Interscope signing them after hearing a single on a San Jose radio station. After adding a keyboardist and releasing their first album in 1997, the band was on their way. Backed by a couple major singles, their first record would certify double platinum. Anticipating an even better result with the sophomore effort, they decided to change their sound from a more ska influence to straight pop. 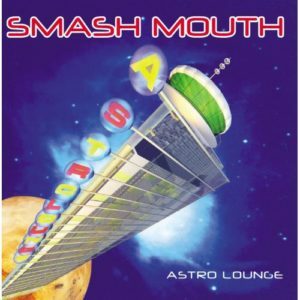 And with that, Astro Lounge was released in June of 1999. The shift in sound ended up being worth it, as the album would go on to spawn a few monster singles, being used in major films such as “Shrek” and in heavily viewed commercials for companies such as Nissan. Certified currently at 3x platinum, on the surface the sales of Astro Lounge seem only marginally better than their first—but the extra exposure was priceless. The recognition the band received because so many songs were used elsewhere meant Smash Mouth definitely became a household name to many. Generally when a pop album comes out like this—a pop album really trying to be one— the reviews tend to be mediocre at best. Not in this case. The critics almost unanimously agreed this was one of the better albums of the year, praising the laid-back sound with a mass appeal. I can honestly say I’ve never listened to this album before today. I was definitely a bit skeptical, since most of what I knew of the band was the more bubblegum-type tracks— how could this album be more than that? Sure “All Star” is still that very signature over-the-top radio single, but the rest of the album is quite toned down by comparison. The cover of 1967’s “Can’t Get Enough of You Baby” was a really nice touch, and added some depth and credence to something set out to be so poppy. Fast forward nearly two decades and the band has seen double digit turnover in personnel and with a continuing change in sound. They have released four more albums since Astro Lounge, but none of them have really caught any heat. Since most of what I hear from Smash Mouth is still the old school, ‘90s version, why not give yourself a treat and listen to them as the band intended today. At $5 bucks, that’s an easy decision.